Calling all illustrators and designers! Nike is giving you the amazing opportunity to show off your creative skills and create artwork for their new Nike Epic React footwear. Nike Epic React’s new foam technology feels so outrageous, it’s contagious. With Nike Epic React, it’s more fun to go far…so much fun, that with React’s lightweight energy return, there’s not much that can convince you to stop! This summer, Nike will show runners the joy of running through two briefs on Talenthouse. For this brief bring to life ‘Go Far’ through your static artwork. Nike invites illustrators, graphic designers and mixed media artists from around the world to creatively bring to life the theme “Go Far” through Nike Epic React product-led visual artwork. Only static artwork should be submitted. The Nike Epic React shoe must be the center of the artwork and should be surrounded by elements that communicate distance. A minimum of ten (10) pieces (and up to 20) of static artwork will be chosen from this brief, and the Selected Artists will receive $1,500. The selected submissions may also be featured on Nike’s social channels and receive exposure from their global community of fans and athletes. PLEASE NOTE: Both Nike briefs on Talenthouse, static artwork and IG Stories are considered separate from one another but both will live under the same visual world, so feel free to submit to both! Before starting on your submission, please read the 'Things to Consider' section below. Nike is looking for static artwork that highlights the Nike Epic React's innovation through creative expressions of “Go Far”. You are encouraged to make it fun, insightful and unexpected! You may submit digital illustrations, graphic designs, paintings, grafitti art, etc. - the artistic medium is open! However, please do not submit any photography or video. The Nike Epic React shoe must be central to the artwork. You may redraw the shoe or include a render of the shoe that can be downloaded from the Asset Pack. Using the provided framework in the Asset Pack as a canvas, create your artwork in either of the following dimensions: 2000 x 2500 pixels / 4:5. Please note, if you are selected, you may potentially be asked to provide your artwork in both dimension sizes. The Nike Epic React gender colorway alignment: Women’s: Peach, Men’s: Navy x Mauve. If creating different color variations for your artwork, please focus on these two colors for the shoes. Nike may potentially select an even number of both colorways, so you are encouraged to submit two color variations of your artwork! You are encouraged to incorporate the FA18 Nike Epic React color palette (see Briefing Document) within your artwork. Nike is looking for fun, vibrant, and fresh visual artwork styles that will make people stop when they see the work in their social feed. The artwork should appeal to 17-24 year old runners who incorporate movement into their everyday life. You are encouraged to include elements that communicate distance within your artwork. Take inspiration from cues you see on a run, i.e. : road signs, mile markers, the environment, metaphors that communicate going far, etc. “Go Far” is the creative theme but the literal term does not need to appear in your artwork. Please refer to the wireframe in the Asset Pack to required shoe positioning and size reference. 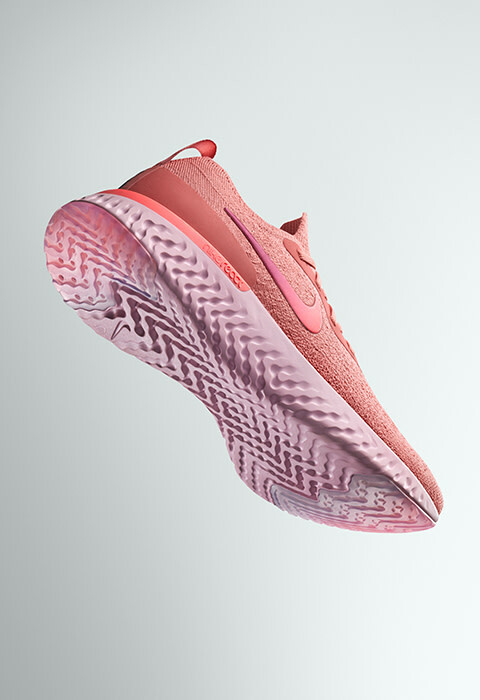 Nike loves work that lets your own unique style shine through and is open to creative interpretations of distance, as well as the appearance of the Nike Epic React shoe (as rendered or redrawn). Artists should include the Nike Epic React foam texture within the piece. Nike is open to how overt it shows up within the artwork. All assets can be found in the Asset Pack. Please avoid making specific claims about the Nike Epic React shoe or including other brand references. Our mission: Bring Inspiration and Innovation to every athlete* in the world. This is what drives us to do everything possible to expand human potential. We do that by creating groundbreaking sport innovations; by making their products more sustainably; by building a creative and diverse global team; and by making a positive impact in communities where we live and work. This opportunity is a closed Creative Invite. Submissions will not be visible by the public and must not be made public anywhere by you. Please do not share your submission on social media or upload your submission to your Talenthouse profile. Artists should retain their original artwork files but work must be submitted in JPEG or PNG, max size 10MB. Please no lifestyle videos or lifestyle photography. Submissions must include the Nike Epic React Shoe (either rendered or redrawn). Please note that you may use the material provided by Nike solely to respond to this Creative Invite, but all rights in and to this material are reserved by Nike. Any ownership in, or usage of, the Work outside of the Creative Invite or any use or public display of any Nike trademarks, copyrights, or other provided content, including but not limited to logos, fonts, illustrations, photos, or slogans, is subject to and restricted by Nike’s underlying rights in the Nike IP; in no event, may an artist obtain a fee, royalty, advertising revenue, or any other payment in exchange for the submission. Please read the "THINGS TO CONSIDER" section carefully. Before creating your artwork, please read this Briefing Document and download this Asset Pack. Nike may modify and/or convert the selected artworks into a different format with the artist's permission. Selected Artists will be required to sign an artist agreement which assigns all rights, title and interest in and to their work to Nike for global usage in exchange for the incentives set forth above. Artists not selected retain ownership in the original parts of their work. Please note that submissions can not be used for personal, non-commercial and portfolio use without Nike's written approval. The Selected Artists must respond to Talenthouse within one (1) day of receiving the notification email or else will forfeit all incentives. Nike will select from all qualified submissions. A qualified submission is one which meets all the Terms & Conditions, Guidelines and Official Rules.